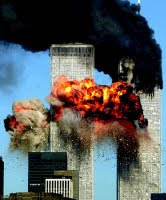 The Spectator reported earlier that the Obama White House planned on desecrating the memory of 9-11 and turning it into a socialist holiday of community service. The plan is to turn a “day of fear” that helps Republicans into a day of activism called the National Day of Service that helps the left. Right on cue the state-run media jumped to action. The nation marked the eighth anniversary of the Sept. 11 terrorist attacks with rain-soaked remembrances and acts of volunteerism honoring those who rushed into danger to help. Around the country, Americans packed up care packages for soldiers, planted gardens for low-income families and painted abandoned, boarded-up homes. The anniversary Friday was declared a day of service for the first time this year to pay homage to those who sacrificed their lives to save others from the burning World Trade Center. Memorials in New York, at the Pentagon and at the crash site of United Airlines Flight 93 in Pennsylvania all took place under gray skies. At the trade center site, volunteers — from soup kitchens, advocacy groups, the Red Cross, the United Way — joined relatives of the lost to read the names of those killed in the twin towers. They spoke under tents to protect against rain. 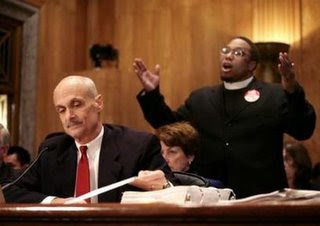 Here’s “Rev” Lennox Yearwood harassing Bush Homeland Security Secretary Michael Chertoff during a hearing in 2006. This is just further proof that the more radical your leftist background, the more likely you will be elevated to a position of power and respect by this administration.